John Bunyan’s children’s version of Pilgrim’s Progress describes a “magic mirror” that shows the reflection of the one looking at it on one side, with all the blemishes, and on the other side is a picture of the crucified Christ. 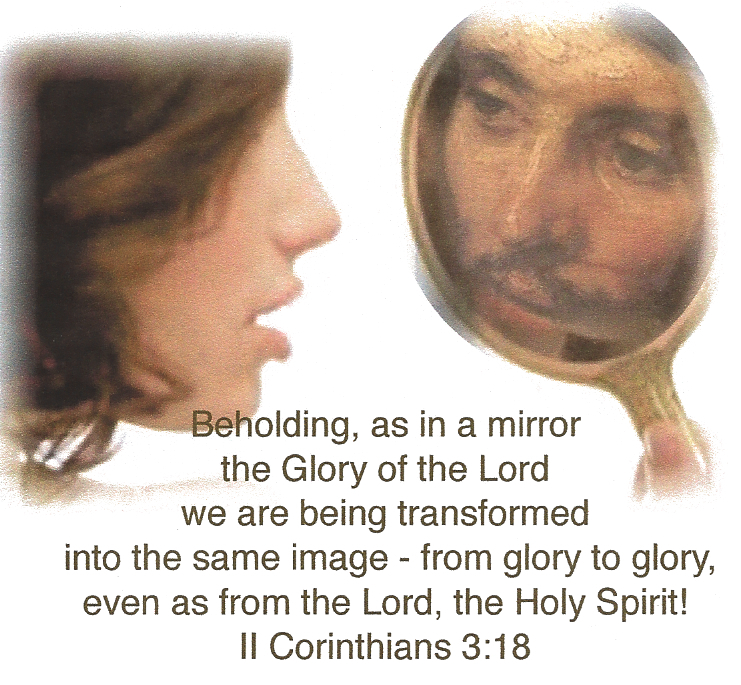 The imagery reminds us that when we look in the mirror we see ourselves for who we currently are, but when God looks in the same mirror He sees us as the likeness of His beloved Son, Jesus Christ. To be sure, God knows and sees our every misstep and mistake . . . our shortcomings and sin. But before the foundation of the world He chose to see us as already perfected in Christ. He sees us as what we will one day be: perfectly conformed to the image and likeness of Jesus. All Christians are currently living in the tension between the “already” and the “not yet” of our salvation. In the eyes of God, we are “already” perfected and conformed to the likeness of Jesus; but you and I know by way of daily experience we are “not yet” perfect. In fact, we are quite a long way from perfection! Knowing that God chooses to see you as He sees His beloved Son is the key to finding the proper motive and motivation for pursuing a life of obedience and holiness. While we see our own sin daily, our God chooses to see only His Son in us. This Gospel truth also frees us from trying to work our way into God’s favor. We already have all of God’s favor. We cannot earn any more of it, regardless of what we do. We are totally loved and completely forgiven. When God thundered from heaven His pleasure in His Beloved Son (Matthew 3:17), He was saying the same thing about us, because He sees us clothed only in the righteousness of Jesus. With that understood, it is important to distinguish between getting God’s favor and experiencing God’s favor. Although we cannot make God love us any more or cause Him to love us any less, we do diminish our experience of God’s love when we break fellowship with Him. When we turn away from God in our sin, we also turn away from our communion with God. He does not turn away from us, but we, when we seek to satisfy our sinful desires, turn away from Him and experience less than God’s best for our lives. When God feels far away we can be certain of one thing: we moved, not God! What should shine brightly before our eyes of faith is the biblical truth that the image of Christ in us—not our sin—is what our heavenly Father chooses to see when He looks upon us. That is the truth that should set us free to be all that God is calling us to be. The human heart knows no more powerful motive to keep marching forward through life than to know that God sees us and loves us as He sees and loves His Beloved Son.